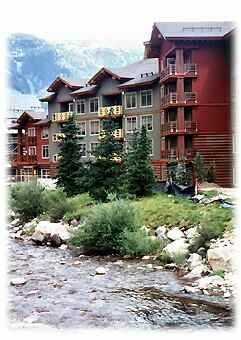 Luxury 2Br/2Ba Condo – Steps to Lifts, Shops, Wireless Internet!! In the heart of the new pedestrian village, this 2 bedroom/2 bath Tucker Mountain Lodge condo makes your vacation effortless. It’s just 50 meters to the American Eagle lift and to the boating/skating lake, and 25 steps to ski school! So hauling your (and the kids’) gear is painless! With a rock climbing wall, coffee house, restaurants, and shopping right outside your door you can save your energy for the fun! And after an active day in the mountain air, you can relax on this luxury condo’s deck overlooking the covered bridge on Ten Mile Creek, unwind in the on-site steam & sauna, and then drift-off in front of its inviting, river-rock fireplace and recharge for another day! 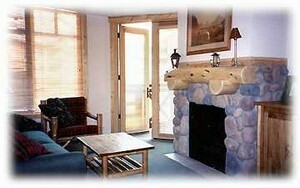 The facility at Tucker Mountain Lodge offers an indoor fitness center, with a sauna and steam room. It also has washers and dryers, and an outdoor hot tub. About Copper: Hailed for years by locals as the skiers mountain, Copper Mountain has 20 lifts over 2433 acres. The mountain artfully blends terrain for the most advanced skiers & boarders, with the gentle, family-friendly slopes of Union Creek. Copper is conveniently located 75 miles west of Denver and Denver International Airport, 25 minutes from Vail, 15 minutes from Breckenridge, 20 minutes from Keystone and is immediately accessible to and from I-70. There is a free shuttle service around Copper Mountain and Summit County Resorts. 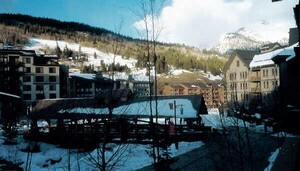 Cross country skiing, ice skating, sledding, rock climbing wall on site. Drift-off in front of the cozy fireplace and recharge for another day! Onsite billiards, hot-tub, steam room, and fitness center ON YOUR FLOOR! Your unit is on the 2nd floor of the first green building from the left! 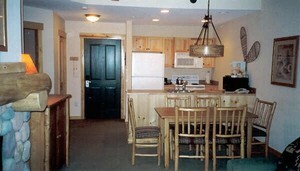 Your balcony overlooks the famous Ten-Mile Creek and the scenic covered bridge. Cozy Master suite with King Size bed, TV and attached Master Bath. Your view looks over Ten Mile Creek and the Covered Bridge. Kitchen is equipped with all utensils and appliances needed. 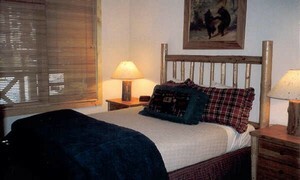 Guest bedroom with pine log, queen size bed. We just returned and had a great time. The unit was clean, beds firm (very important to us). It included a dish towel, dish soap, towels for each bathroom (obtaining more from housekeeping in the morning was easy enough but we had plenty), and paper towels. The kitchen was stocked adequately for our needs. I wish it would have included dishwasher soap (maybe it did...we didn't ask housekeeping). The laundry area was very convenient. We've always stayed in a unit that included machines but this worked out great. We loved the heated parking. For the last 3 years we stayed at Snowmass and that wasn't an option at TOV. The ski lockers were easily accessible...and in a heated room. We didn't use the jacuzzi or go look at it. There was a small work-out area on the first floor that people were using but we were pretty beat by the end of the day. Our oldest son went to ski school about 80 yds from the door to the building. We used the shuttle twice and left early and skied twice to get our younger daughter over to Union Creek for her lesson. It wasn't a hassle. We loved the location of this unit. Our view was of Starbucks across the covered bridge. Needless to say, we didn't complain about that either. One last thought, it would be very tight if you tried to fit 6 or more in this unit. Our teen age son slept on the Queen bed in the second bedroom and our 11 yr old slept on the queen sleeper sofa and did do some complaining (not enought to be willing to sleep with the brother). I laid on the sleeper sofa and thought it was good as far as that type of bedding goes. I would definitely come back and stay in this unit again. Discounts: 6+ nights 10% discount (except Holidays) 6 night minimum during most Holidays; Holidays include Christmas, New Years, President’s Day, Spring Break/Easter. 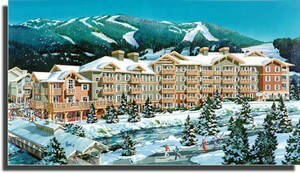 Deposit: For ski seasons, 50% deposit due to hold the reservation & 50% due 90 days in advance of arrival. During off season 25%/75%. Cancellations and Refunds: If cancel more than 90 before scheduled arrival, entire deposit will be refunded. If cancel within 90 days of reservation and unit is rented for time of your reservation, then a $75 service fee will be charged. For Peak, Holiday & Regular Season reservations: If cancel within 90 days of reservation and unit is not rented for time of your reservation, then no refund can be granted. We will make every effort to re-rent the unit if you have to cancel, however, due to the high demand for lodging in Tucker Mountain Lodge during the ski season, late cancellations cannot be refunded in full. For Spring/Summer/Fall Seasons reservations: If cancel within 45 days of reservation And we cannot re-rent the unit for the time of your reservation, then a 50% refund will be granted.